Do you hate “convincing” people to buy? Are you tired of trying to “make” them listen? Now you can learn how to GET YOUR MESSAGE ACROSS by creating a relationship with your audience. This practical webinar will teach you an actionable, positive approach that works—whether you’re speaking to one person, ten people or thousands! 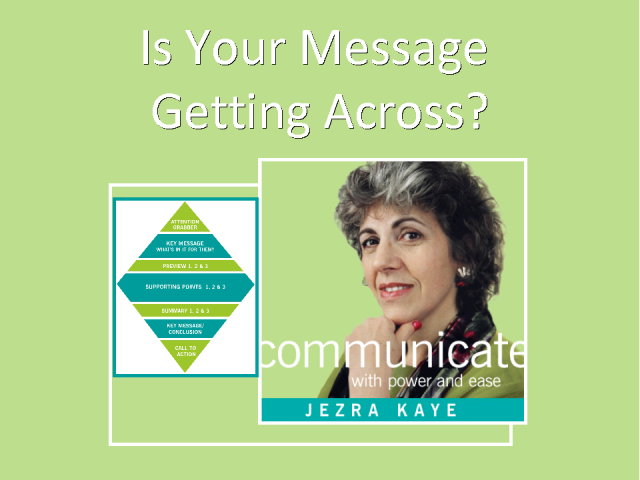 Jezra Kaye helps people communicate with power, authenticity and ease, to foster enduring business success. She is a veteran speechwriter and speaker coach to Fortune 100 executives, and a former jazz singer and bandleader. Title: Is Your Message Getting Across?